Final group games get underway today. Neymar carries Brazilian hopes at the Rio Olympics. A classy performance from Mexico which takes them through to a last 16 tie against Holland. Having weathered some early pressure form Croatia they gradually took control of the game and ultimately ran out comfortable winners. Three second half goals in the space of ten minutes finished off Croatia who, not for the first time, lost their composure in a high pressure fixture. It’s all over in Brasilia. Brazil have finished top of Group A and will now play Chile in the second round in Belo Horizonte. Neymar again proved to be Brazil’s saviour; the scoreline may seem emphatic but Brazil did not have all their own way, with Cameroon proving to be tricker-than-expected customers in the first half, before being pegged back after the break. Ante Rebic lunges in dangerously on Carlos Pena and the referee shows a red card. Ivan Perisic scores a late consolation for Croatia. It’s a neatly worked move down the left and Rakitic back heels the ball into the path of the Perisic, who shoots through the legs of Guillermo Ochoa. Substitute Fernandinho pokes the ball past Itandje after a neat exchange of passes. The crowd had been getting jittery after Mexico scored a third against Croatia. But Fernandinho’s strike restores Brazil’s top place in Group A. Too easy for Mexico. It’s a corner that’s flicked on at the near post and Javier Hernandez steals in at the far post to nod home from close range. Surely there is no way back for Croatia now. The unmarked Guardado slots home from 12 yards to put the game out of Croatia’s reach. Skipper Rafa Marquez, the oldest player in the squad, may have put Mexico in the last 16. The veteran defender, captaining the side for the 4th World Cup, climbs highest to head home a corner from close range. It is no less than Mexico deserve. Andres Quadrado smashes a volley towards goal, but his effort us blocked by the arms of Darijo Srna. The Mexicans are convinced they should have been awarded a penalty and looking at the television replays, they have certainly got a strong case. Croatia, who have offered nothing since the interval, were lucky to get away with that. 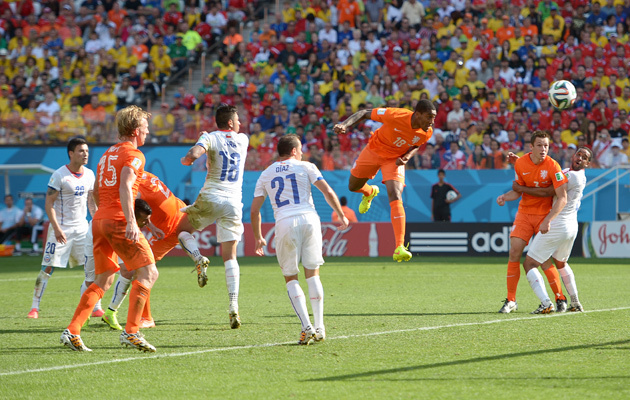 Fred has something to celebrate – his first goal of the tournament. The Brazil striker was offside when he headed in David Luiz’s cross, but the officials ruled Brazil’s third goal should stand. It’s Neymar 2 Cameroon 1 in Brasilia. Brazil are in front at the break but it’s all down to Neymar, whose two goals have more than made up for some poor Brazilian defending. Cameroon were expected to roll up and roll over, but they have threatened the Brazilian goal on a number of occasions, including Joel Matip’s equaliser for 1-1. It’s safe to say that there are more goals in this. Tempers are beginning to fray in Recife with both teams committing a number of niggly fouls. The stop-start nature of the game favours Mexico, who only require a point from the game to progress, and who, since Herrara hit the bar, have looked the better team. For Croatia, the half-time whistle has come at a good time, giving them the opportunity to regroup. Neymar puts Brazil back in the lead with his second goal of the game, his fourth of the tournament. Cameroon’s defence backed off and allowed Neymar the time and space to run into the area and crack a fiercesome low drive that wrongfooted Cameroon keeper Itandje. Cameroon have silenced the crowd with an equaliser! Left-back Allan Nyom got the better of Dani Alves and played a low cross into the area. Centre-back Joel Matip, who had headed against the crossbar a minute earlier and was still up front, touched home from close range. Croatia have made all the early running, but it is Mexico who come closest to scoring when Hector Herrera lashes in a left foot shot from 25 yards out, which beats the goalkeeper but rebounds back off the bar. Fantastic effort. Neymar scores the 100th goal of the 2014 World Cup. Luiz Gustavo stole the ball from Cameroon and crossed from the left. Neymar placed the ball into the corner of the goal with an emphatic side-foot finish. In a game they must win to qualify, Croatia make one change from the team that steamrollered Cameroon, with Sime Vrsaljko coming in for midfielder Sammir. Mexico, for whom a point will suffice, remain unchanged from the goalless draw against hosts Brazil. Croatia: Pletikosa, Vrsaljko, Pranjic, Perisic, Corluka, Lovren, Rakitic, Modric, Srna, Mandzukic, Olic. Mexico: Ochoa, Rodriguez, Marquez (c), Herrera, Layun, Dos Santos, Moreno, Guardado, Peralta, Aguilar, Vazquez. Hulk, who missed the draw with Mexico with a thigh injury, is back for Brazil, while Cameroon again leave Samuel Eto’o on the bench. The final whistle has gone in Curitiba and it’s been a very comfortable win for the already eliminated holders. Goals from David Villa, in his final international match, Fernando Torres and Juan Mata, ensured that Spain do not suffer the indignity of finishing bottom of Group B.
That’s it then, all over in Sao Paulo. Holland top the group ahead of Chile who had far more possession but could not find a way through, although they were denied a number of penalty claims. Holland score a brilliant breakaway goal, Memphis Depay slotting home Arjen Robben’s cross after Nigel De Jong had set up the counter-attack following a Chile corner. Spain are back! Juan Mata makes it three, collecting a lovely floated cross from substitute Cesc Fabregas, before slotting through the legs of Mat Ryan. Substitute Leroy Fer scores with his first touch, rising unmarked to head home a cross from the right after Chile initially cleared the corner. Chile’s lack of height in defence costs them early. First goal of the tournament for Fernando Torres and again Iniesta was the architect. The midfielder slides a perfectly weighted pass through to Torres who takes one touch before guiding the ball past Mat Ryan. Significant moment on 56 minutes as the goalscorer David Villa is substituted. That marks the end of an international career that began 9 years ago and saw the striker set a Spanish record of 59 goals in 97 appearances. He also holds Spain’s World Cup scoring record with 9 goals at the finals. We’re back underway in Sao Paulo. Chile have made a change, replacing Felipe Gutierrez with Jean Beausejour, who has gone to the left side of a front three. Neither side is treating this game like a dead rubber and Spain’s superior quality eventually told with David Villa’s finish. A glimpse into the future with this match too, with Iniesta, in a more central role, looking the perfect replacement for Xavi, when his fellow Barcelona man calls it day. Australia, in the absence of the suspended Tim Cahill, look toothless. Chile have had the lion’s share of the possession (74 per cent to Holland’s 26) but they haven’t been able to convert it into chances. In fact, neither side has had a shot on target. The Dutch have had more opportunities, though: Stefan De Vrij took advantage of Chile’s lack of defensive height to head a free-kick just over, while Wesley Sneijder set up Arjen Robben for a run into the area but Holland’s captain pulled his shot across goal. Felipe Gutierrez’s back header over from a free-kick went over for Chile, who have angered the Dutch defence with their penalty claims. Dirk Kuyt and Ron Vlaar took confronted Eduardo Vargas after the Chile striker took a tumble in the box. A nicely worked goal from Spain. Andres Iniesta picks out the overlapping Juanfran with a lovely pass and his cut back is steered in by a clever David Villa back flick. It’s the striker’s 59th international goal. As suggested by some of our Dutch colleagues, Holland are playing a 5-3-2 rather than 4-3-3, with Dirk Kuyt at left wing-back tracking the Chile wing-back Mauricio Isla. Wesley Sneijder is the more advanced of the midfield three. Spain make seven changes to the side that lost 2-0 to Chile. Pepe Reina replaces veteran Iker Casillas, while Fernando Torres and David Villa reunite up front. There is no place for Sergio Busquets, nor for Atletico Madrid striker Diego Costa. Australia bring in Newcastle Jets forward Adam Taggart for the suspended Tim Cahill, while injured Mark Bresciano is replaced by Oliver Bozanic. Australia: Mathew Ryan; Ryan McGowan, Alex Wilkinson, Matthew Špiranović, Jason Davidson; Mile Jedinak, Matt McKay; Tommy Oar, Oliver Bozanic, Mathew Leckie; Adam Taggart. Spain: Pepe Reina; Juanfran, Raúl Albiol, Sergio Ramos, Jordi Alba; Xabi Alonso, Koke, Santi Cazorla; Andrés Iniesta, David Villa, Fernando Torres. Holland coach Louis Van Gaal has sprung a surprise by naming Dirk Kuyt in his starting line-up. The official teamsheet from FIFA has Kuyt starting on the left side of a midfield three, but there are also suggestions from Dutch colleagues that Kuyt will play left wing-back in a 5-3-2. Ghana has denied claims that the president of the country’s FA agreed to arrange international friendly matches with a match fixing syndicate. These Belgian fans had plenty to smile about. Check out this and more great images from our latest Brazil 2014 gallery. Iran were unhappy about the standard of refereeing in their 1-0 defeat to Argentina on Saturday. So much so, they have submitted an official letter of complaint to FIFA, complaining about the unjustness of it all. Diego Maradona responded in characteristically pugnacious fashion when told by Argentina Football Association president, Diego Grondona, that he was a jinx on the national team. Cristiano Ronaldo has not been himself at Brazil 2014. He arrived at the World Cup carrying a knee injury, which is clearly impeding him and depriving Portugal of his trademark pace and power. Without him functioning at his best, Portugal are an extremely ordinary team and despite their late equaliser against the United States, look set for an early exit. Keir Radnedge has been monitoring Ronaldo’s contribution and concluded that he is paying a very heavy price for a demanding club campaign with Real Madrid. The final round of Group matches get underway today. We’re also at the stage of double headers which means that we’re in for four matches today, two kicking off at 17:00 (BST) and the other starting at 21:00 (BST). There are still a number of issues to be resolved in both groups. In Group A, only Cameroon, who face hosts Brazil, have got no chance of reaching the knockout stages. Brazil will need a win to be sure of topping the group, while in the other match and barring an unlikely Cameroon win, Croatia must beat Mexico to progress. Group B is more straightforward: Holland and Chile, who meet in Sao Paulo, are both through, but a win for Chile will take them above the Dutch and in all likelihood mean they avoid a potentially tricky second round encounter with Brazil. Australia and holders Spain are playing for pride only, but their meeting in Curitiba may well see us bid an emotional farewell on the international stage to several members of Spain’s Golden Generation.